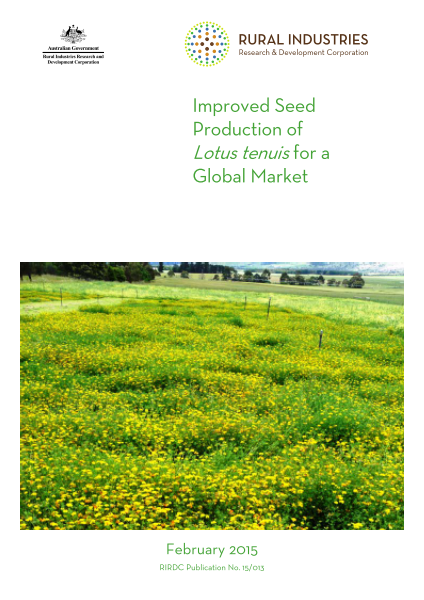 This report presents the findings of a three year project which investigated the potential for development of new selections of the perennial legume, Lotus tenuis (narrow leaf birdsfoot trefoil), which overcome existing issues of seed production, primarily related to the seed pod shattering nature of this species. In addition, the salinity and waterlogging tolerance of L. tenuis were investigated to confirm the physiological mechanisms that confer this ability on the plant and to explore whether there was significant variation in tolerance across a broad range of accessions and existing cultivars. Finally, the results of investigations on the effect of daylength on flowering and the feed quality of L. tenuis are presented.